Here’s a very entertaining interview with Tom Baker and Sophie Aldred of Doctor Who fame (the classic period). Baker’s at his best here, given enough room to expand upon his tallish stories, but not overstepping the bounds of good taste. 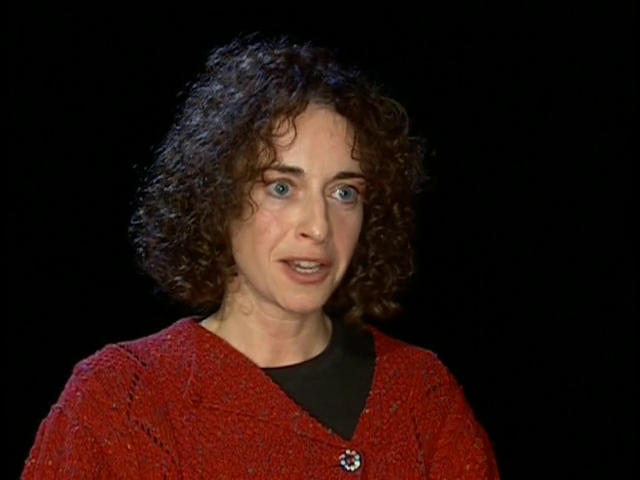 Sophie counterbalances him nicely with some lovely stories of her own, as they appear together on a pledge drive for Maryland Public Television broadcast in 1990. I suppose the reason I wanted to post this now is that with the Trump administration occupying so much of the communications bandwidth in American life, we forget that actors and artists express themselves so much more gracefully. The president and his spokespeople regularly abuse the English language (arrivederci Scaramucci), so it makes a nice change of pace to listen to people who can put together sentences with intelligence, grace, and wit. 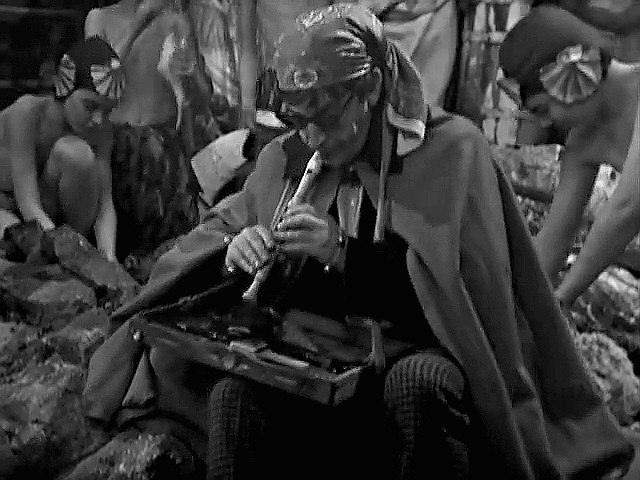 Tom Baker is especially good at spinning yarns with an improvisatory air, but occasionally landing on a serious point. Still, the atmosphere is light, and the paper plates stuck hastily to the studio walls in fond emulation of the old TARDIS set help ensure that we’re never far from a giggle. Vous n’allez pas me transformer en poisson! Mastering that phrase is the key to your survival should you ever be captured by French-speaking Atlanteans! 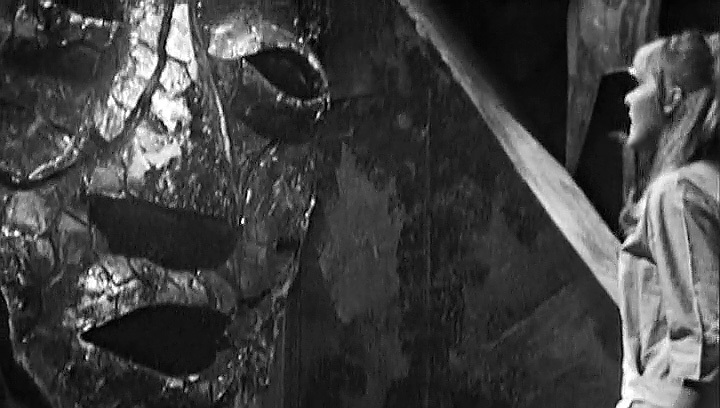 All in all, one of my favourite Doctor Who documentaries — far better than the underlying story. Note: If the embedded video doesn’t play, watch directly on Vimeo here. See also full DVD release available from Amazon. By dawntreader72014  Posted in Doctor Who, Humor	 Tagged 1960s camp, A Fishy Tale, Anneke Wills, apostasy, atrocity story, Bithika O'Dwyer, Doctor Who, documentaries, fishy stories, Frazer Hines, Patrick Troughton, The Underwater Menace, You're not turning me into a fish! I recently had no choice but to have some work done in my apartment. 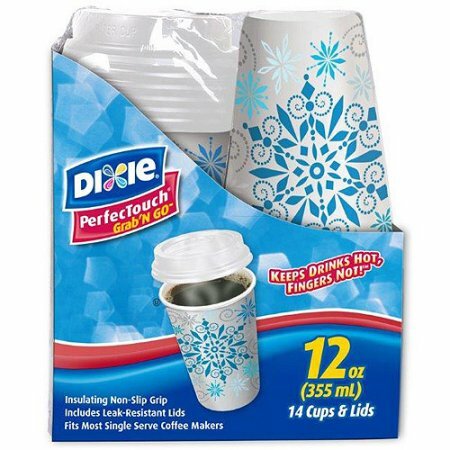 I was probably the last person to still have copper wiring for phone/Internet, and the company gently drove this point home by shutting off my service and telling me that if I didn’t upgrade to fiber optic I would be communicating using two Dixie cups and a string. The Dixie cup phone (string sold separately, may require some assembly), used by an entire generation of children to share their hopes, dreams and fears with each other. Also used by the Nixon administration during secret negotiations with Hanoi. To indulge in a Basil Fawltyism, I had been waiting for fiber optic longer than Hadrian. (Hadrian. The Emperor Hadrian — look, it doesn’t matter!) So I was impressed when the company sent two crack technicians out to do the job. Unfortunately, they came packed in one set of chinos. So enormous was this fellow that in order to make it out onto my fire escape to drill the hole, he had to be coated with bear grease from head to toe; and even then he required that I place myself like a human shield between his combat boots and the floor. While tacking the wiring to my living room ceiling, he began to teeter on his ladder, like a great teapot perched upon the tower of Big Ben during a thunderstorm. When he appeared in genuine danger of falling, I bravely bolted to his rescue. Unfortunately, I took a wrong turn somewhere and was later found cowering under the bathroom sink. A few days hence, when the backup battery unit arrived in the post, I found that it could not be connected because he had installed the power strip upside down and flush against the wall, thoroughly (and quite efficiently!) obscuring the battery jack. My building is also undergoing maintenance by plumbers — at least that is the rumour, and I do occasionally hear plumberlike bangings, though these could be from sound effect recordings. The plumbers are never actually seen, and never actually show up, but we tenants do receive periodic admonishments to remove all personal belongings from areas the plumbers might wish to access. I have duly cleared the space around my refrigerator. 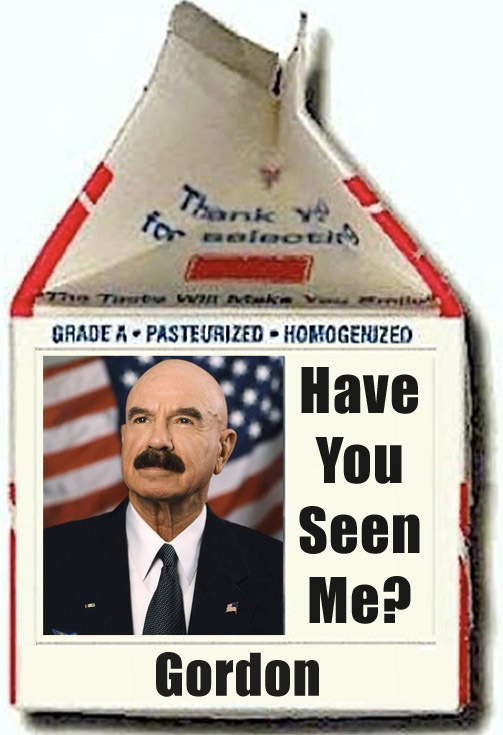 G. Gordon Liddy, one of the plumbers used by the Nixon administration to stop leaks, e.g. by breaking into Daniel Ellsberg’s psychiatrist’s office. Makeup courtesy House of Pancakes. Some rooster parts available for sale to interested parties. So there you have it — everything you need to know about apartment living! Samuel Bradshaw is an IT manager famous for abusing the Internet (and his former friends and colleagues) by using multiple sock puppets to post hate material. Bradshaw was associated with the American Family Foundation (a.k.a. International Cultic Studies Association), which tries to maintain a respectable public face, but often links to extreme hate material and uses people like Bradshaw to post it. According to Bradshaw, he met with attorney Herbert Rosedale, then president of AFF/ICSA, on a number of occasions to discuss how to avoid being sued for libel. 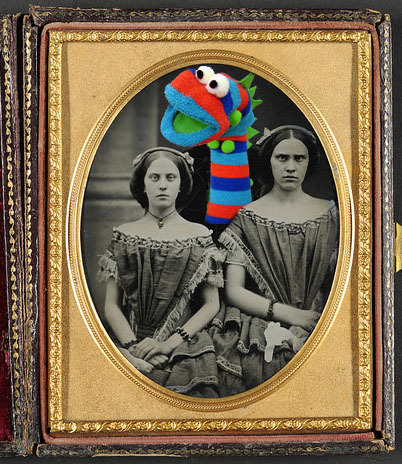 The strategy they apparently worked out was for Bradshaw to keep changing sock puppets on a regular basis, going from “Steve Stevens” to “SEEKER” to “iamschubert” et al. Though Bradshaw has no training in psychology or counseling, he began giving anti-cult advice on the Internet. He would tell people to stop meditating because meditation reinforces destructive mind control. (Everyone who believes this, raise your hand!) He also began promoting exit counseling services, offering to get people discounts. This is consistent with a familiar type of fear marketing used by anti-cultists consisting of the “one-two punch”: a sermon on the evils of cultism followed by a sales pitch for some sort of anti-cult product or service alleged to cure afflicted individuals. Maybe a cream to smear on your temples so you can stop chanting nam-myoho-renge-kyo. While Bradshaw’s antics may seem funny in retrospect, they call attention to the serious problem of hate on the Net, which I’ve addressed seriously elsewhere. Those familiar with AFF/ICSA would know that its leadership consists primarily of a subset of psychologists and lawyers who take the fringe view that spiritual groups pose a danger to scientific rationalism and secular materialism. Few spiritual seekers or scholars of religion would agree. The religious tolerance point of view is based on everyone just getting along. AFF/ICSA opposes spiritual groups not only by circulating anti-cult propaganda (sometimes using third-party technique), but also by persuading former spiritual seekers to view themselves as “cult victims,” to purchase anti-cult “therapy” sessions, and (once they’ve been told during faux therapy that spiritual practice is abusive) to then sue their former spiritual group. A bit of a racket IMHO. For example, when Samuel Bradshaw was trying to stir up enthusiasm among apostates for filing a lawsuit, he became dissatisfied with the lackluster quality of atrocity stories or “testimonials” they were submitting. So he gave them a link where they could read stories about a different guru (not the one they followed) which they could then use as models for stories alleging abuse. The above was an Easter egg for “The Dominators,” and if you ask me the serial code, I think it was “D.” 😉 Their routine may owe a little something to Abbott & Costello (“Who’s On First”) and to the Monty Python Cheese Shop Sketch. So a hearty hats off to the Scottish Falsetto Sock Puppet Theatre, the American Family Foundation, and the ever-protean Samuel Bradshaw. If someone knocks on your door and offers to attach electrodes to your arm to determine whether you are or are not a cultist, it might just be Bradshaw — whether or not he’s wearing any socks. I usually prefer Firefox, but if you’re still having trouble viewing a Dailymotion video (even on the Dailymotion site), try using a recent version of Google Chrome. Dailymotion should really make their site backward compatible and equally accessible from all browsers and from Flash 11 on up. I’ve even dared to propose this to them, but you know how the French are: between making cheese and surrendering, they’re already severely overtasked. 😉 Software designers frequently get caught in the bells & whistles trap. They think that what makes a site popular is bells & whistles, when what most end users want is basic functionality. Just play the damn video! Some cast members barely survived location filming at Warmwell Quarry, where temperatures reportedly soared into the hundreds. Lisa Bowerman, who was decked out in Fun Fur as a Cheetah Person named Karra, came down with heat stroke. 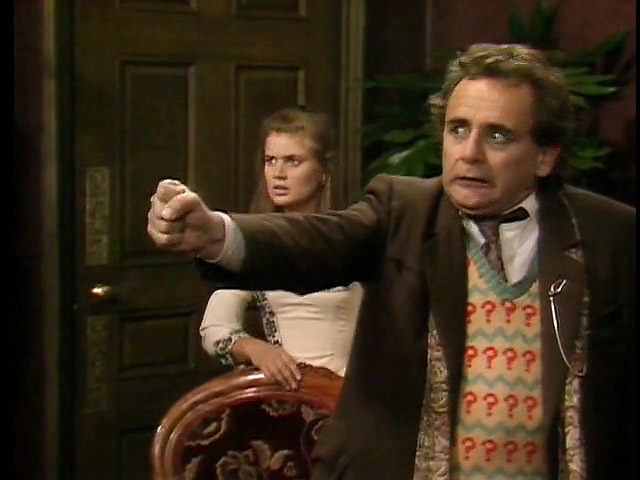 Sylvester McCoy, who played the Seventh Doctor, was troubled by the heat, but more so by fellow actor Anthony Ainley’s approach to method acting. With an impish half-grin, McCoy recalls how Ainley (who played The Master) beat the crap out of him. 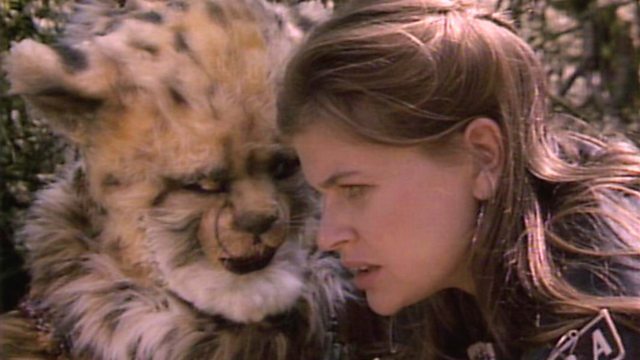 Sophie Aldred, who played Ace (and famously beat up a Dalek), is allergic to cats and barely survived playing a scene with a black cat without giving out a sneeze that would have blanketed Perivale. 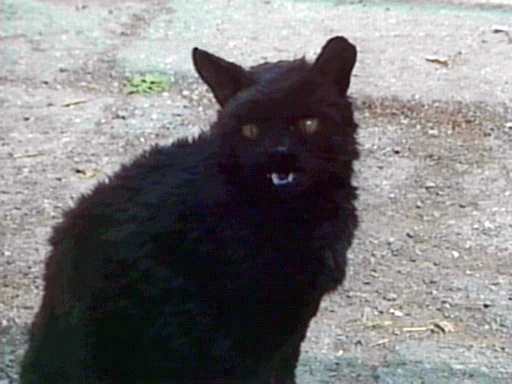 In addition, the animatronic cat used in some scenes (pictured above) was none too convincing, and had to be augmented by bringing in a sack of live cats, coaxing them to perform on cue — not much harder than getting cats to march in a parade. As finicky as these cats were, they demanded tea breaks and to be paid union scale. 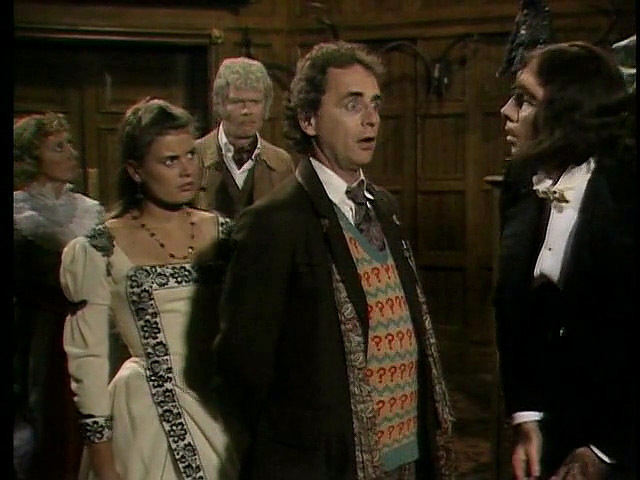 The Doctor to Ace: There are worlds out there where the sky is burning, the sea’s asleep, and the rivers dream. People made of smoke, and cities made of song. Somewhere there’s danger, somewhere there’s injustice, and somewhere else the tea’s getting cold. Come on, Ace — we’ve got work to do! But like the Doctor himself, the series ultimately managed to survive by regenerating. 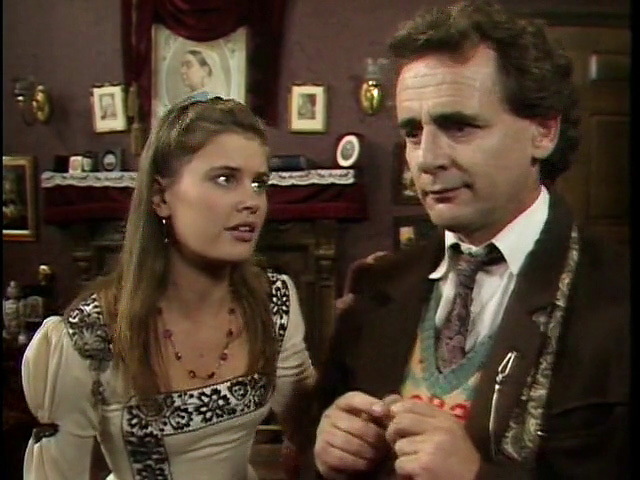 Such regeneration was far from instantaneous, but when the series finally returned after a 16-year hiatus, one time-honoured Who tradition thankfully did not survive: the tendency to produce the show on a shoestring budget. “The BBC Steadicam — a bit of rope and a lens,” Sophie Aldred famously remarks in an outtake from “Battlefield.” Yet when the series returned in 2005, it was given a budget that allowed for special effects comparable to major film releases. No more cheap rubber monsters (though the monster in “Vincent and the Doctor” is a bit goofy-looking, and does slightly resemble the carpet monster from the 1964 camp horror flick The Creeping Terror). Perhaps more important to the new Who’s artistic merit, the character of Ace influenced the way that new Companions like Rose Tyler and Amy Pond were written. They had to have a good back story, be emotionally complex, and really drive the series, not just be window dressing or foils for the Doctor. Still, in an analogue to the classic Peter Cook & Dudley Moore routine about a “unidexter” applying for the role of Tarzan, things haven’t reached the stage where unattractive women need apply. At least, having complex female characters who drive the series is progress for Doctor Who. Things weren’t always that way. 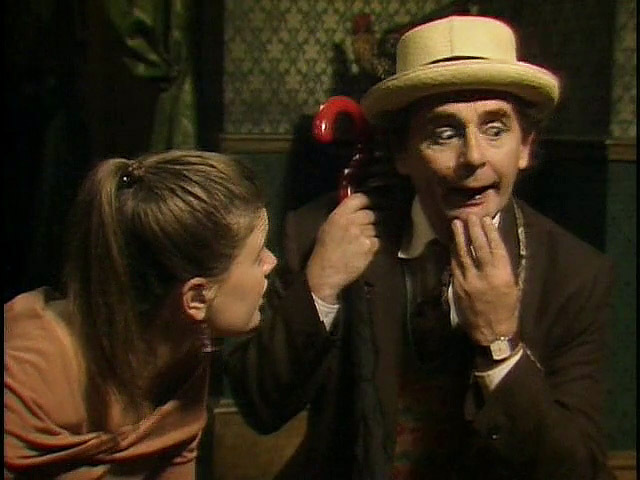 Back in the 1970s women wanted challenging roles, and though actresses auditioning for Companion were often promised same, their roles frequently degenerated into screaming and being rescued by the Doctor. 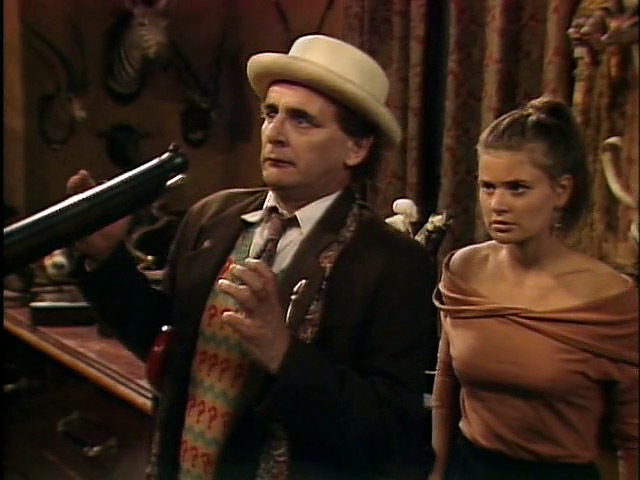 This was even true of Sophie Aldred’s immediate predecessor, Bonnie Langford, who played Melanie Bush. Though Andrew Cartmel originally had high hopes for bringing out Mel’s complex side (she was supposed to be a computer programmer), that complexity never emerged and Mel became instead the paradigmatic shrill screamer, able to shatter glass at thirty paces. The character of Ace marked a genuine turning point for the show, and the final (26th) season was all about seeing Ace develop emotionally. “Survival” was written by Rona Munro, whose interest in feminist theory was not so heavy-handed as to spoil the story as entertainment. 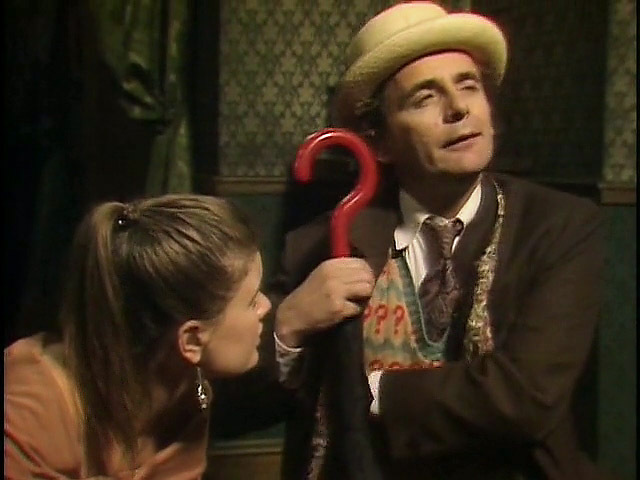 The strong female Companion is one good feature of “late period classic” that survived the regeneration. Another surviving feature is the occasional dalliance in Doctor Who with political themes, usually left-leaning. “The Happiness Patrol” (also from season 26) is about a totalitarian world where it’s a crime to be unhappy. The main baddie is a female monarch who’s a scathing sendup of (then Prime Minister) Margaret Thatcher. The new Who has its share of political themes and subtexts. “The Beast Below” (S05E02) is arguably about the exploitation of labour, or exploitation of Third World resources by First World powers. It’s also about repressive tolerance. You are free to protest, but those hitting the “protest” button are quickly whisked to Starship UK’s dank lower extremities. The story is also about survival and the ethical compromises a developed nation will make in order to survive. The implication is that few people can bear to know the truth about the means used, and those who see the truth find it more convenient to forget it. Survival is a major theme of Doctor Who, and of science fiction in general. The survival theme may be handled crudely or elegantly, with comic-strip characters or complex human ones, but it tends to inform much great drama. Trivia: In the dry spell between 1989 and 2005, some of the forms in which Doctor Who survived were novels and audio productions. 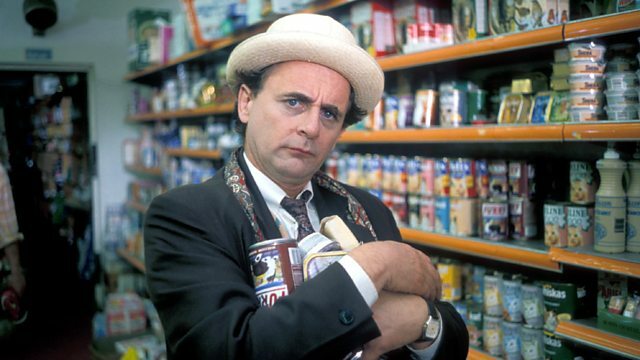 The Seventh Doctor got a new Companion called Bernice Summerfield, who followed in the Ace tradition by being complex, rebellious and anarchic. Eventually, the character became independent of the Doctor and branched out on her own. In the numerous Bernice Summerfield audio plays produced by Big Finish Productions, Lisa Bowerman, the actress who played Karra in “Survival,” plays Bernice. Need a butler? Just bring your friendly neighbourhood Neanderthal out of stasis. Under the gun: Such rude treatment from the Royal Geographical Society! Sophie & Sylvester (who share the same birthday) fooling around between takes. The joke is that Sylvester is supposed to yell “Cover your eyes!” But because he’s blinded by the light he keeps covering inappropriate body parts, causing Sophie to totally crack up. This fan page is intended to promote the BBC series Doctor Who. All source videos copyright BBC. Photoshopping and expressive captioning by Michael Howard. 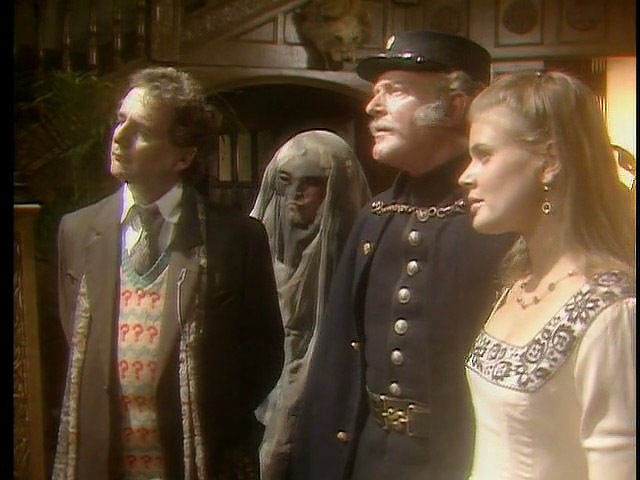 “Ghost Light” was the last story filmed during the classic period of Doctor Who, which ranged from 1963 to 1989. Even the actors claimed to be a bit befuddled by “Ghost Light,” which (on the surface) is about a group of eccentric characters holed up in a Victorian mansion. But aliens and monsters are afoot, and amidst this scintillating mix of Gothic horror and theatre of the absurd there lurks a subtext concerning evolution. Darwin and his theories engendered much popular debate in Victorian Britain — and not a few comic songs, the best known of which is John Young’s “The Darwinian Theory” (a.k.a. “Have you heard the news of late/ About our great original state?”). That’s the way to the zoo! But there’s room enough for you. Such a lot of nuts! Sung with obvious amusement by Katharine Schlesinger (who plays Gwendoline), the line “Such a lot of nuts!” can’t help but remind us of the oddball characters we’ve met. Interviewed for the DVD extra “Light in Dark Places,” Schlesinger’s eyes light up when she talks about how much she loves singing. 1. It was edited down to fit in the allotted time, and so proceeds at breakneck pace, making it hard for the audience to grasp the plot twists. There wasn’t time for breathers or pacing punctuation marks. 2. 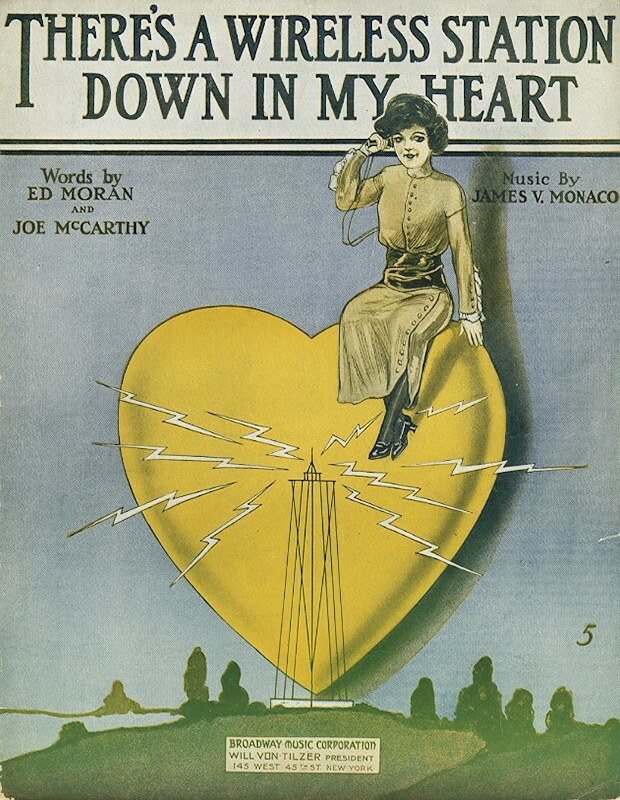 The music was mixed rather loudly, so that one strains to hear the actors, whose genuinely witty repartee is sometimes drowned out. Ace: Don’t you have things you hate? The Doctor: I can’t stand burnt toast. I loathe bus stations — terrible places, full of lost luggage and lost souls. And then there’s unrequited love, and tyranny, and cruelty. The Doctor: Let me guess. My theories appall you, my heresies outrage you, I never answer letters, and you don’t like my tie. Vincent Van Gogh: O Happy Day! The song is by Don McLean, but the female vocalist is Chyi Yu. What a piece of work is a man! How noble in reason, how infinite in faculty! In form and moving how express and admirable! In action how like an angel, in apprehension how like a god! Gods and angels have little place in Doctor Who; but what I find generally about the decline of faith and the advance of humanism also applies here: If we are made in the image of our Creator, then even having banished Him from our existence, we cannot help but mirror some of His qualities. And so, as human beings we discover compassion and empathy and take them to be human qualities, so vain are we. Artists and other creative thinkers often discover transcendent qualities. They are no less transcendent even if mislableled. So, in “Vincent and the Doctor” it’s easy to spot compassion and empathy and be blown away by them. SPOILERS: At the end of the episode, Amy Pond bounds up the stairs of the Musée d’Orsay convinced there will be hundreds of new Van Goghs because, after all, they changed his life, right? She’s so crestfallen to find that in spite of everything, he still killed himself at age 37. No new canvases. 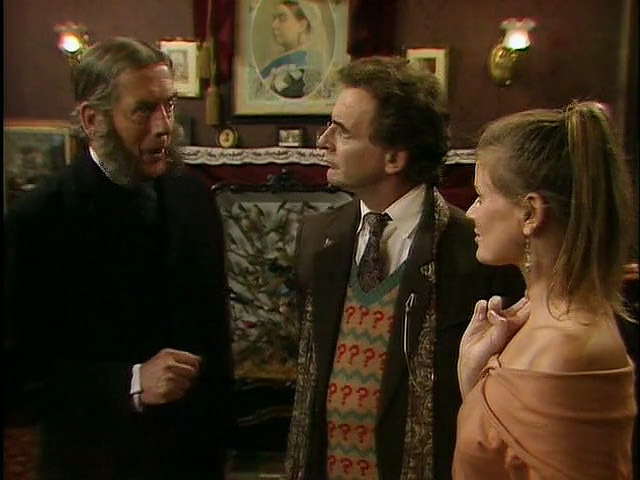 Being an art documentary fanatic, I’ve seen quite a few about Van Gogh, but none seemed to capture so much of what we’ve come to feel about Van Gogh as this Doctor Who episode written by Richard Curtis. If there are comic flourishes to help offset the pathos, that’s to be expected since Curtis co-wrote Blackadder and The Vicar of Dibley. So think of Van Gogh, watch “Vincent and the Doctor,” and if you’re moved to tears, consider that what you may be experiencing is God’s compassion refracted through the human mind. Tom Baker (who played Doctor Who from 1974 to 1981) recounts how Michael Wisher (a.k.a. 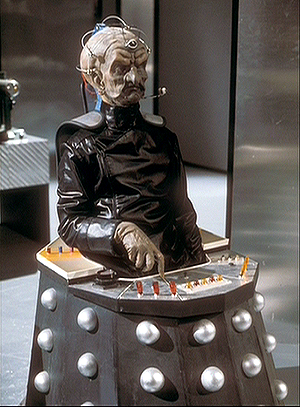 Davros) managed to be terribly funny by having no sense of humor. It’s been said that Douglas Adams was the quintessential British nutter, but Tom Baker gives him a run for his money. Quite a lot of the people who work with me are dead — particularly directors. The word has got out: Directors who work with me often die mysteriously afterwards, sometimes in agony.